“Honey, could you come to the bathroom for a minute and look at what Bobby’s done?” “Oh my, that is quite a vibrant shade of red, let’s panic and take him to the emergency room.” I don’t have kids but I imagine that’s how the conversation would go if your child’s bathroom output was an unnatural color, but it turns out it’d be an unnecessary visit. In fact, doctors are peeved at Flamin’ Hot Cheetos for sending parents needlessly rushing with their kids to the emergency room, all because of that pesky red food dye that’s used to show just how flaming hot those Cheetos really are. Schools are already pushing back against the snack and banning it from their campuses due to its lack of nutritional value, reports CBS News. And there’s also research out there that likens the brain’s response to the snack to how addicts crave drugs. But in this case, it’s just red poop that’s worrying parents. All that red dye can color your stool, say medical professionals, if you’re ingesting large quantities of the stuff. But parents immediately see blood when they see red and rush off to the hospital. Most of the time, they’re wrong. “Food such as beets or red peppers can make stool appear red, however it is not actually blood in the stool,” an emergency medicine physician for a New York hospital, told CBSNews.com. You have to eat so much of the stuff, however, that if you’re seeing red in the toilet it could be a sign that you’re eating way too many Cheetos. The poo problem with Cheetos isn’t the only health concern surrounding the snack, however. 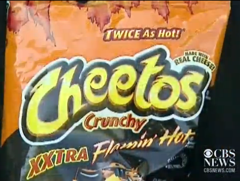 “A number of patients who have consumed these Cheetos in excess have complained of pain in their upper abdomen, rising up into their chest, likely due to due to the red peppers and spice contained in the snack,” said one of the doctors, warning that if you already have problems like acid reflux or heartburn, Flamin’ Hot Cheetos could lead to a flare-up. So the next time Bobby has a questionable output, look at his hands and face first to see if they’re covered in remnants of red Cheetos dust before you head to the ER.